The vast “corn belt” of the Midwestern United States, the “amber waves” of wheat in India’s Punjab region, and the rice paddies of Southeast Asia – iconic landscapes that could disappear before too long. Our three most valuable calorie sources are all in peril from the negative effects of climate change. 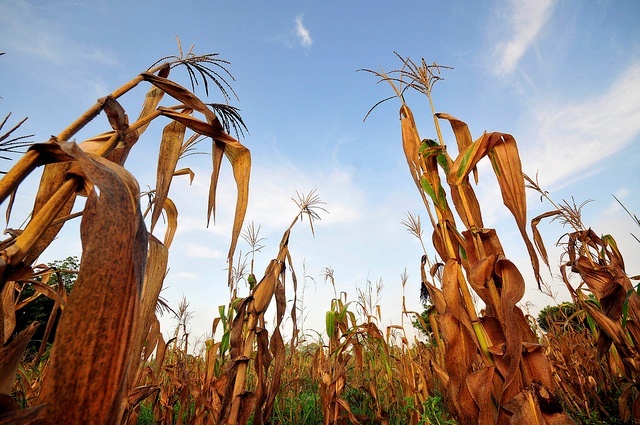 Maize yields tend to wilt with temperatures above 30 degrees Celsius, and wheat is vulnerable to drought, a phenomenon expected to increase drastically in occurrence. Rice, the grain that feeds over half the world, is exposed to a perfect quartet of negative impacts: flooding in some areas, drought in others, heat stress, and soil salinity increases. Food producers – and consumers, too – are going to have to adapt in a big way. Just in time for the close of the second Global Conference on Agricultural Research for Development (GCARD2) in Punta del Este, Uruguay, a new ultimatum explains the changes facing food systems and the research and investment focuses needed to respond to them. Yesterday the CGIAR Research Program on Climate Change, Agriculture and Food Security released its Policy Brief No. 6, Recalibrating Food Production in the Developing World: Global Warming Will Change More Than Just Climate, a collaboration between 70 CGIAR scientists. GCARD2 attendees should take note: The lessons from this policy brief could have big implications for the priorities laid out at the close of the conference. Will we still be able to develop effective foresight when extreme climate events could change everything at the drop of a hat? What can we do to ensure that the capacity of agriculture to adapt to these changes – to “recalibrate”, as the brief suggests – is developed and maintained? What sort of strategic partnerships will we need to develop to confront the major changes agriculture will have to undergo? Although GCARD2 has come to a close, the real work is now beginning. Scientists, farmers, politicians, developers, youth, and everyone in between – Let’s get recalibrating!